Posted March 30th, 2019 by Mike Boyes & filed under Consciousness, Language-Thought, Neuroscience. Description: When I was in graduate school (back in the stone age) I took a seminar course in cognitive psychology that was run by Daniel Kahneman (who would later receive the Nobel Prize in economics for his work on human decision making and cognitive biases) and his wife Anne Treisman (also a noted cognitive psychology superstar). Each of us enrolled in the seminar had to take responsibility for doing a presentation at some point in the course in which we were to provide an overview of the current state of knowledge in an assigned area of cognitive science. I actually do not recall what my assigned topic was (though that likely means I survived without serious criticism) but I do recall the presentation of the unfortunate graduate student (who was actually working with Daniel Kahneman) who was charged with presenting on the topic of consciousness. She seemed quite nervous as she led us through a very informative overview of the concept of consciousnesses address in eastern religions and philosophies and of early “scientific” efforts to locate consciousness within the pituitary gland. She then talked a little bit about sleep research and research into metacognition and then turned to her supervisor and apologized for the fact that she was not able to find any work in cognitive psychology that directly addressed the question of the nature and location of consciousness. Daniel’s comment was to simply shrug and to say something like “No there really hasn’t been anything sensible done on that question yet – what’s next”?” In the nearly 40 years since I took that seminar and during which I have taught introductory psychology which typically contains a section on consciousness and I can tell you that Daniel Kahneman’s summary comment has largely continued to apply, until recently. We are seeing an increasing number of questions being raised about the status of Artificial Intelligence and part of that has begun to involve questions about AI and consciousness, partly just out of curiosity and partly out of concern over what might happen if or when AI becomes conscious (see I Robot, Ex Machina, Transcendence, or even Blade Runner for a sci-fi treatment). 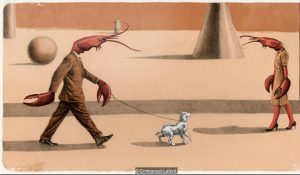 We are also seeing a resurgence of versions of the age-old ethical question of whether lobsters experience pain when they are boiled alive for dinner that are broadening into deeper questions about animal consciousness and their ethical standing on our planet. So, where to start on the question of the nature and location of consciousness? Well, enter Giulio Tononi, neuroscientist. Read the article linked below to see where he is proposing we go to try and develop a coherent, testable theory of consciousness (and not just human consciousness but general and even hive and perhaps, at some point, AI consciousness). Source: Are we close to solving the puzzle of consciousness? David Robson, future, BBC.com. So, what do you think of Integrated Consciousness Theory? There is something compelling, to me at least, about the idea that consciousness is likely about the integration of information – it just seems to fit with what has always seemed to be a necessary part of any account of the nature of consciousness – that ist must be greater than the sum of any amalgam of information gathering parts. As many of the commenters quoted in the linked article say, Integrated Consciousness Theory is a good starting point and it IS explorable AND, to a degree, testable. It is going to be fascinating to see where this line of (conscious) thought and inquiry takes us! What does consciousness do for us? What do you make of Integrated Consciousness Theory and what do you think ir can do for us?